Along with the rebuilding of inner city Christchurch, the music scene has also been on the up and the Merchants are riding a wave of reggae revival in the Canterbury region. Having established a solid fan base in Christchurch our next step is to take our music to the wider New Zealand, no mean feat considering the task of managing the eight members! Before we set off on tour we have a single, or two, in the mix to be produced and released with a music video accompany it if possible. The actual song to be recorded is yet to be decided, though we have had a number of requests for recording! Having had a taste of being a part of events such as The Raggamuffin Roadtrip, we would love nothing more than to continue being a part these events. So the best thing we can do is to keep on keeping on, ensuring our sound grows and we continue to give the people positive vibrations. Coming up in the immediate future is the chance for the Merchants to share the stage with Katchafire who will be in full swing of their nationwide tour. Opportunities such as these are not to be taken lightly so we'll be going hard at practices making sure we uphold the mana of Otautahi reggae and consolidate our position as one the up-and-coming Kiwi reggae bands who should be on everyone's watchlist! 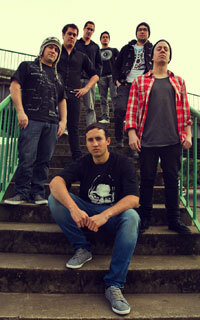 The Merchants of Flow are Kp (vocals, guitar), Tihi (vocals, keyboards), Lenny (vocals), Marcus (lead vocals), Tahu (alto saxophone), C (bass), James (tenor saxophone) and H (drums). Muzic.net.nz has one of the most extensive databases of New Zealand bands and musicians on the internet, with over 2,600 listings. We also have a range of easy to use online tools to allow you to keep your page up to date. 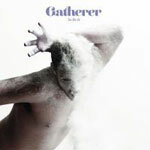 Artists currently listed on muzic.net.nz who have access to update their information include Minuit, The Rabble, Sola Rosa, Midnight Youth, Kimbra, Bleeders and In Dread Response. All listings are provided for free and are automatically listed on major search engines. If you don't have an artist page, you only need to complete our add artist form. More information about filling out our add artist form can be found here. The muzic.net.nz fortnightly newsletter is a popular, member’s only service. Over 8,500 members currently receive our newsletter, and this number grows every day. A feature in our newsletter is a brilliant way to promote yourself or your band. If you are interested in a muzic.net.nz newsletter feature, email lisa@muzic.net.nz for more details. Muzic.net.nz is home to one of New Zealand's largest online gig guides. Our gig guide offers fast and free listings whether you're performing for one night only, or completing a 20 venue tour. Gigs are also e-mailed to members subscribed to our fortnightly gig guide mail out. If you want to further promote your tour we can also include a poster in this mail out. You can also e-mail your press releases and any available tour posters to gigs@muzic.net.nz and we’ll add your press release to our gig guide news. To add gigs or tours, you can either complete our add gig form or email gigs@muzic.net.nz with all the details. Press Releases announcing gigs or tours can also be added to our very popular gig guide forum. If you're heading out on tour, we can hook you up with a featured listing, giving you maximum exposure. Tour features appear on the front page of our gig guide and give a complete run-down on whatever your offering. You decide what you want to put in it (press releases, tour posters, publicity photos etc), and we'll create your tour feature for you. Links to tour features are also added to our Facebook page and included in every newsletter and gig guide mail out going out before the end of your tour. E-mail lisa@muzic.net.nz to discuss having a tour feature created. Thanks to our team of volunteers located around the country, we can arrange for your CDs (including online versions) and gigs to be reviewed. In some cases we can also interview you. We're also happy to provide copies of any reviews completed for use in your own marketing. Email lisa@muzic.net.nz to arrange a review. We offer advertising for very competitive rates. Send an email to adam@muzic.net.nz if you would like to discuss advertising on muzic.net.nz. Proudly supporting New Zealand music since 1999. 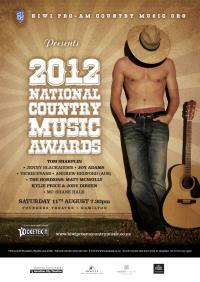 The 2012 National Country Music Awards (NCMA) will see the cream of New Zealand country music strumming their way to Hamilton’s Founders Theatre on Saturday 11 August. 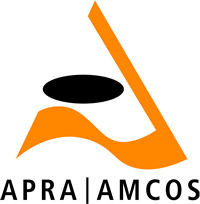 NCMAis the most prestigious event on NZ’s country music calendar and will feature performances from Kiwi country music legends Tom Sharplin, Jenny Blackadder, Joy Adams, Australian guest artist Andrew Redford plus new stars and 2012 Horizon Nominees Kylie Price, Matt McNeilly, Jody Direen. *The NZ Horizon Award winner will have the added distinction of performing at the Global Artist Showcase (part of the CMA Music Festival in Nashville). Satellite Media has developed the mobile app for The Edge, which is currently sitting at number one in the Apple App Store only one day after its release. ‘The Edge – Turn it Up App’ is a free download available from the Apple App Store now, and available on Google Play for Android from July 23. Partnering with MediaWorks and NZ on Air, Satellite Media developed the app to allow The Edge listeners to enjoy the full Edge experience wherever they are. “The Edge new mobile app is everything our listeners want, but right at their fingertips”, says Emily Hancox, The Edge Marketing Manager. Janine and the Mixtape has gained critical acclaim in New Zealand after the release of her successful debut single, ‘Bullets’. And now the 22-year-old singer, songwriter, producer and multi-instrumentalist, has been signed to Warner Music New Zealand with her debut EP to be released in August. Combining 90’s hip-hop beats, R’n’B vocals and intricate synths with soul-baring lyrics; Janine’s sound focuses on her voice, the beat, and lyrical honesty - which is at the heart of every track. Having spent her whole life devoted to music, Janine (who used to sneak into bars from the age of 14 to play open-mic nights) completed a Bachelor of Music at the University of Auckland in 2010 and also went on to win the University’s singer/songwriter of the year award later that year. Regina Spektor returns to NZ to wow us once again! Jamie McDell playing FREE all age shows at Amazon stores! Add yourself or your band to muzic.net.nz! Emma interviewed Tomorrow People for the site. You can read Emma's interview here. You can check out every single interview and review in our Articles Page. The next muzic.net.nz newsletter is going out on Sunday 29 July! Feature space is available in our newsletters from 29 July! ...even if you featured in a previous year. You can choose any newsletter date which suits you. We can also feature record labels, venues, music stores, music websites and anything else that has something to do with NZ music! If you would like to feature in a muzic.net.nz newsletter, contact Lisa for further details. Muzic.net.nz newsletters are sent out to over 8600 members! With this number growing every day, featuring in our newsletter is an excellent promotional tool. Our newsletter archives are one of the most accessed areas on the site. If you would like to advertise anything to do with NZ music in our newsletter and/or gig mail out, email Lisa. It is 100% FREE to feature or advertise in our newsletter and gig mail outs! The next muzic.net.nz gig mail out is going out on Sunday 22 July.